A jury trial in California has resulted in a guilty verdict against the agrichemical and GMO giant, Monsanto, now Bayer/Monsanto. The judge has ordered Monsanto to pay damages of USD 289 Million to former school groundskeeper Dewayne Johnson, who has non-Hodgkin’s lymphoma. His lawyer argued it was caused by Monsanto’s glyphosate-based weed-killer Roundup. Not surprisingly Monsanto plans to appeal the verdict. The impact of the ruling, regardless of the outcome of the appeal, will unleash worldwide consequences that spell huge problems for the entire GMO agrochemicals business model. Another paid Monsanto witness, Dr. Warren Foster, was forced to admit he had never done a study of glyphosate or its carcinogenity before Monsanto paid him to testify against the animal studies used by the International Agency for Research on Cancer (IARC), a WHO agency, which determined glyphosate a “probable carcinogen” in 2015. The IARC ruling was a major blow against Monsanto’s claims that its Roundup, with some 31% of glyphosate, was not harmful to animals or humans. In a peer-reviewed scientific paper published on February 26, 2016 in the International Journal of Environmental Research and Public Health, a team of toxicologists led by Gilles-Eric Séralini of the Institute of Biology, University of Caen in France and András Székács, Director of the Agro-Environmental Research Institute of Hungary’s National Agricultural Research and Innovation Centre, tested the most commonly used glyphosate-based herbicides including Monsanto Roundup. They tested the complete cocktail, including the co-formulants and formulations used in combination with glyphosate. Their tests concluded, among other things, that the compounded herbicides using glyphosate as base, but including undisclosed “formulations” or surfactants, were vastly more toxic than glyphosate when tested alone, up to 2,000 times more toxic to cells than glyphosate alone. Monsanto has never revealed its trade secret co-formulants, neither to the US Government as it is compelled to by law, nor to the public. 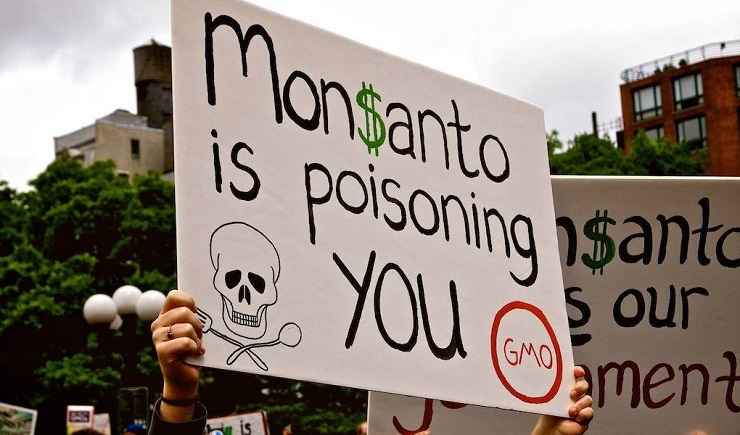 The results of the latest San Francisco court ruling against Monsanto are clearly but the beginning of a groundswell of opposition to toxic and carcinogenic agrochemicals, most sold by Monsanto and now Bayer/Monsanto. Concerned citizens around the world are beginning to connect the dots and to realize we are being played not only for fools but played in a play with potentially deadly consequences.